TickSmith, a leader in big data applications for Capital Markets, today announced a jointly authored white paper with leading global data analytics and machine learning platform provider, Cloudera on MiFID II and best execution for financial organisations in Capital Markets. 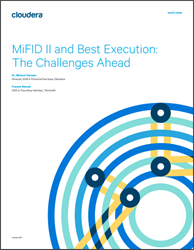 The white paper, entitled “MiFID II and Best Execution: The Challenges Ahead,” explains MiFID II RTS 27 and 28 data management and reporting requirements and illustrates how they can be addressed using big data technology. In addition to the white paper, TickSmith and Cloudera have also held webinars on this subject. TickSmith, with its TickVault platform, is a leader in Big Data applications for Capital Markets and financial services. TickVault is used for data centralization and distribution, compliance, market surveillance, strategy discovery, and analytics. TickSmith received the 2015 Innovator Award for Best New Hadoop-Based Platform for Management of Brokerage Data by the FIA, the world's leading trade organization for the futures, options, and cleared swaps markets.